2018 was my year for venturing into the world of mid-distancing swimming. Having partially avulsed my high hamstring tendon from the sit bone and ripped the other, hiking and biking were off the cards. 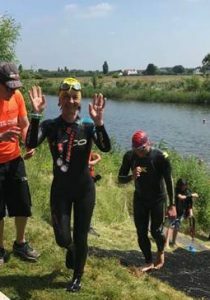 Enjoyment of the outdoors is an essential part of how I balance myself and the emotional impact of working with families who have suffered healthcare harm so I casually asked my GP if he thought training for a 10k open water swim would be a good idea – ‘for you yes’ was the instant reply. Not being one to undertake things in half measures I decided to fill my diary with swimming and to see if I could make a few pounds for AvMA, Advocacy after Fatal Domestic Abuse and Hundredfamilies.org. 40 kilometres of swim events later the open water season (for me) came to an end with the Hurly Burly on 29 September, in Snowdonia. The experience has been remarkable, with highs, lows and funny moments. The best swim was in June – I loved it. The one that challenged me the most – Coniston water – 5 ¼ miles with no river flow is a long way when you are cold and tired. The support of James Titcombe and his lovely daughters in caring for my dogs provide the necessary internal warmth I needed to keep plodding along, completing in 3 hours and 3 minutes. The coldest – the Hurly Burly in Snowdonia on 29 September. I, along with others, very nearly threw in the towel I was so cold, but the fabulous safety crew kept everyone going, and the incoming tide delivered me to the finish in an amazing 1 hour 50 minutes. A cool 1 hour 6 minute faster than Jubilee. The funniest moment was getting lost in the mist during the Rutland Water Swim, getting out thinking my Garmin had a breakdown and then realising that I’d missed out a kilometre of the swim, alongside about 12 other swimmers! Rutland will be revisited as ‘unfinished business’ another year. One of the unanticipated benefits of the years events was discovering a love of camping, along with my four legged friends Pickles and Clyde, who consider an airbed duvet to be fair game! The fund raising? I was aiming to raise £600 and achieved £450, less the ‘Just Giving’ fees to be split three-ways between the charities. Happy enough with that. Any last minute donations are gratefully received. Next Year? 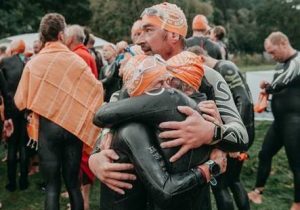 If anyone wants to join me in the super challenge of the Thames Swim Marathon, 14K (8 miles) on 4 August next year for a ‘team AvMA’ event let me know! Places are running out fast so you’ll need to enter ASAP. I’m in wave 5. If you want to join Maria in the Thames Marathon, please book your place direct using the link below. Please email AvMA to let us know you’ve entered – we will pass your details on to Maria.